(Newser) – A teenage suicide bomber blew himself up outside NATO headquarters in the Afghan capital today, killing six civilians in a strike that targeted the heart of the US-led military operation in the country. 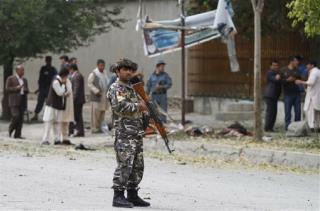 The Taliban claimed responsibility for the blast, the latest in a series of attacks carried out by insurgents in Kabul. The bomber struck before noon outside the headquarters of the NATO coalition, on a street that connects the alliance headquarters to the nearby US Embassy, the Italian Embassy, a large US military base, and the Afghan Defense Ministry. All the victims were Afghans, police said. no big deal! only nato! Why do we continue to help such an ungrateful nation? Meeting 70 virgins seems to be a powerful incentive to self-destruct.